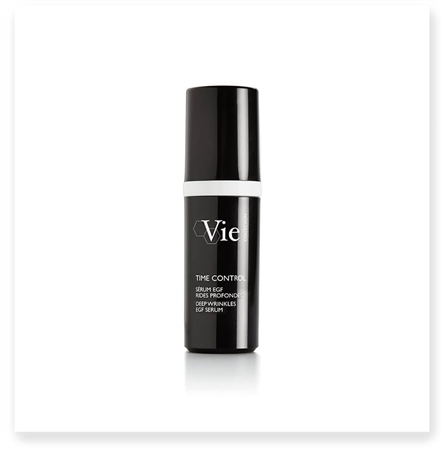 TIME CONTROL DEEP WRINKLES EGF SERUM is a solution to reverse biological skin aging inspired by the anti-aging power of epidermal growth factors (EGFs).TIME CONTROL has an energizing scent with floral, fruit and amber notes. It has a light, milky consistency that immediately melts into the skin leaving a velvety finish while soft-focus powders blur wrinkles for an instant smoothing effect. In one month*, deep wrinkles are smoothed, tissues are redensified, the skin is plumped up and youth is restored. * Measurement of the smoothing and anti-wrinkle effect on crow’s feet. Instrumental test on 24 volunteers after twice-daily use. Average value obtained on 10 of the 24 volunteers. Overall result -6%. 2D Illustrations and macro photography of one of the best results. Apply morning and/or evening to perfectly cleansed face and neck, underneath facial cream. Tested under dermatological control. • EGF-like Peptide - obtained by chemical synthesis, with the same mollecular structure as EGF. Mimics natural EGF and “deceives” EGF receptors, activating cell division and increasing the speed and efficiency of cell regeneration. • EGF-ACTIV Complex - obtained via biotechnological process. Strengthens the cohesion between the two sub- units of the EGF receptor, ensuring its bond with both the EGF and the EGF-like peptide. Increases cell division capability for faster and more efficient cell renewal.